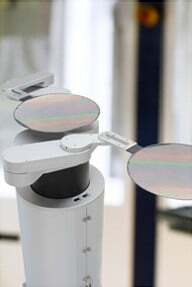 Moving from LAB to FAB, the Micro Device FAB is an excellent next step for development of flexible hybrid electronics. The Micro Device FAB is a seamless automated manufacturing solution. The Sheet-to-Sheet (S2S) approach, has versatile setup creating endless possibilities to combine tools and technologies. 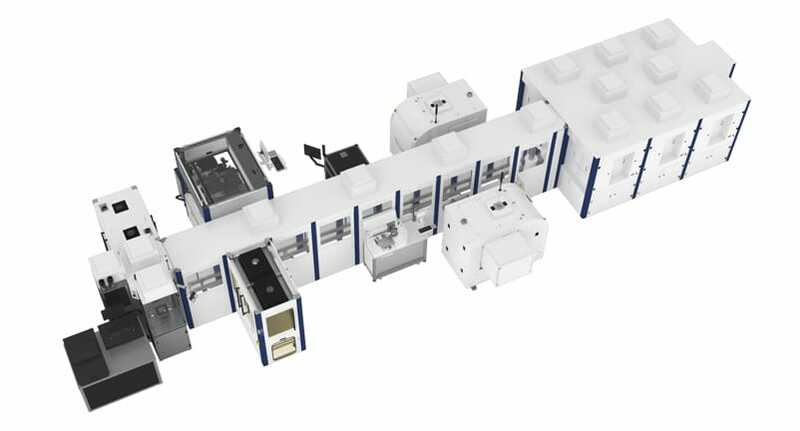 The system enables free programmable process routing and sequencing like wet chemistry, micro plasma, vacuum deposition, laser, pick & place, die bonding, multi-functional inkjet printing and (photonic) curing processes. The Micro Device FAB can be configured as an automated LAB where you perform process research and development per stand-alone tool. Apart from the above, you can switch the system to automatic and repeat mode. Scheduled 0-series and small production runs are executed as the innovation runs are created, achieving speed in development and simplicity in logistics. The Micro Device FAB is a versatile and stable system. Reproducibility and the shortest time to market are key features moving the ideas from innovation to industrialization. This creates new possibilities and solutions for exotic materials and special applications in niche markets. In the field of hybrid electronics, (i.e. chip manufacturing), production either happens on single wafers or substrates in laboratories, or in very large quantities in factories. Middle-scale manufacturing is virtually non-existent. The absence of middle scale manufacturing creates various problems. When a Research and Development division wants to scale up to production, they need to do so in factories. If the technology turns out to be unreliable, and most of the batch is defective, a lot of resources are wasted. If a company simply wants a limited quantity of electronics, that too is difficult. Production in a lab is labor intensive and time consuming. Production in a factory is not designed for small quantities. In all of the above cases, the solution in the current market is expensive. The Micro Device Fab was designed to cater to these medium scale production problems. The Micro Device Fab is designed with the flexibility of a laboratory in mind, while implementing various useful concepts from large volume manufacturing. The entire Micro Device Fab is a local clean room. Inside, robots move substrates around. Lab technicians and/or operators do not need to go through the entire sanitation process. 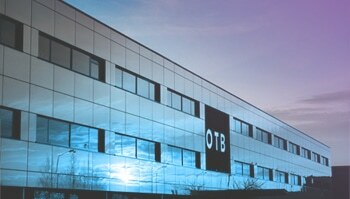 Substrates maintain within an environment that provides stable and continuous production. Even at night, when lab technicians are not available, the Micro Device Fab can produce electronics automatically. The Micro Device Fab production system is a fully automated and a multifunctional system set up. This production solution can be configured on request based on needed equipment, tools and process sequences. Substrates with a maximum size of 200mm x 200mm can be processed and automatically transferred into different process stations. 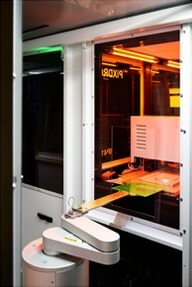 The production solution provides a multifunctional toolset and automated transport through localized clean environment. Process development and integration is highly effective running on this fully automated manufacturing system. Ramp up and new product introduction (NPI) projects can be effectively executed into pilot and small series production. All parameter sets can be tuned and optimized during pilot runs. Qualified and controlled reproduction is guaranteed by automated sequence and software controlled process routing. Within this production solution, the controlled and integrated production environment gives direct and secured access to the technology with fast feedback loops. This leverages and accelerates time to market for innovation tremendously. DoMicro BV can support in defining and specifying such a Micro Device Fab as well develop the integrated processes and/or manufacture specific products and devices in small to medium volumes. The Micro Device Fab accommodates the need of research departments, universities and institutes for independently and confidential research, proof of principles and micro system innovation. 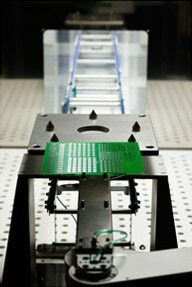 The multifunctional and automated production system creates the ability to seamlessly transition from LAB to FAB. 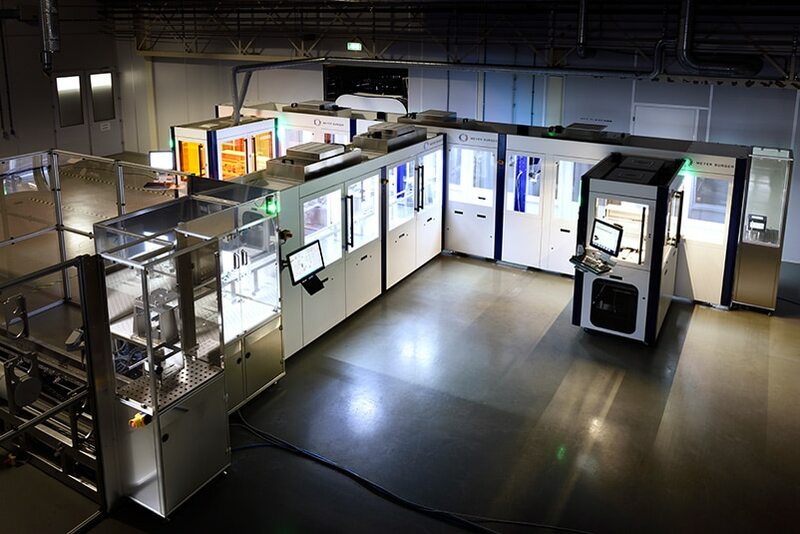 Processes can be developed on top of a dedicated toolset, operating both stand alone and connected by automation for easy reproduction and repeatability. The Micro Device Fab is an electronic manufacturing solution for complete micro and flex material devices. Applicable for PCB Substrates, Glass, Ceramics, Foils (on frame), Wafers (Cassette System) MEMS, Semiconductor and OLED devices including simulation and computer added manufacturing (CAM). It includes all major manufacturing steps for advanced integrated electronic designs and functional printed electronics. All processes are configured in one clean environment. System integration and realization of the Micro Device Fab is performed in close collaboration with Meyer Burger Netherlands BV.